New boats from Ovingtons now come with righting lines to make recovery from a capsize easier when in the water. They consist of a rope with the inner core replaced with elastic and attached between the shroud mountings and the transom. These wern't supplied as standard on the early boats, but can easily be retro fitted. 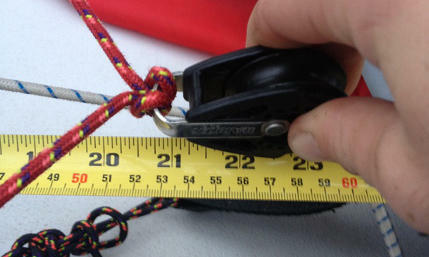 The mainsheet should be threaded through a large plastic ring before it goes through the ratchet. This ring should be connected to the eye on the boom using 6-8mm rope, so that it hangs approximately 45cm (18 inches) below the boom. 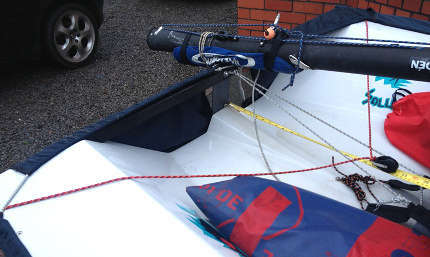 The standard setup used by the majority of Solutions sailors has a bridle at the transom, just like an RS200. 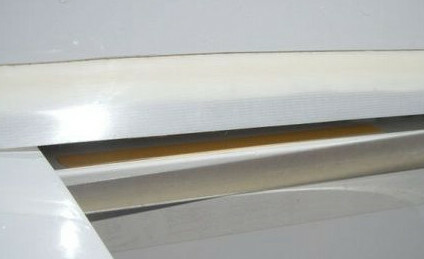 The following pictures show the length of the standard strop. A few sailors have experimented with a Laser style traveller, although there isn't enough evidence to show whether one option is better than the other. 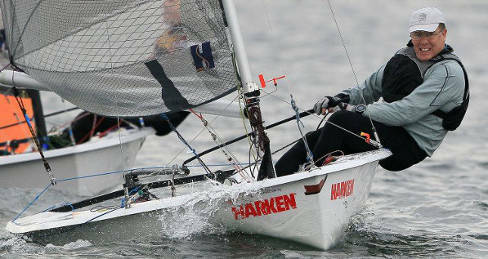 Does your Solution centreboard ‘float up’ at certain points? 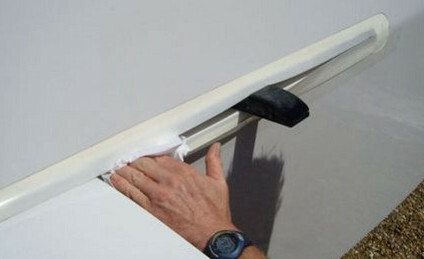 The first port of call can be to tighten the centreboard ‘brake’ by turning the screw. The long term answer is to add extra packing to the centreboard case- the best packing to use is ‘Jap tape’ available in most good chandlers. 1. Clean and de-grease the necessary area (typically just behind the ‘fully down’ position) using acetone or methylated sprit (not white spirit as this contains oil). 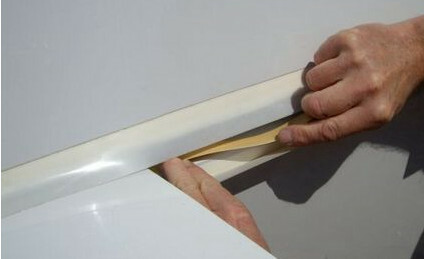 Wedge the slot gasket open with a piece of wood or a sanding block (as pictured). 2. Cut the Jap tape to length – 6 inches/ 15cm should be plenty. Offer up to the case to make sure you can have sufficient access.